If your child is one of the 60 million kids around the globe that have adopted a pet monster to play with on Moshi Monsters, then you'll want to check out the Moshlings app recently released by Mind Candy. Moshlings are the adorable and cleverly designed pets that Moshi Monsters love to collect in the game. You can use this app to learn the back stories of each of the 60 available Moshlings, which have their own unique backstory - and more importantly, use the information on each Moshling to crack secret codes found on MoshiMonsters.com. Beyond that each, Moshling makes its own noise/laugh, our favorite by far is Iggy. Each Moshling is categorized into species (i.e. Foodies, Fluffies, Ninjas) with generally up to four Moshlings per group. You can customize your Moshling with over 100 stickers by adding noses, faces, etc and then can share out your creation with friends by clicking on the camera button at the bottom of the app's screen to take a photo to send out. 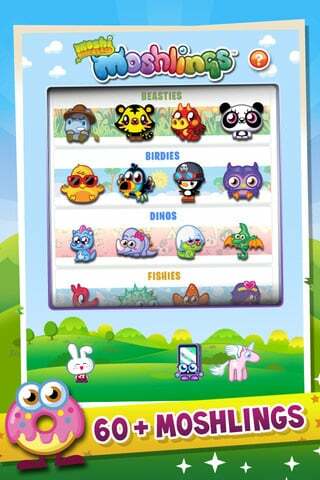 Moshi Monsters: Moshlings is a great extension of the site for rabid fans looking for original content and a portable way to engage with their Moshlings. Moshi Monsters: Moshings is available for download for the iPhone/iPad for $0.99 on iTunes.